On a rainy, cold night in Kansas City, Center went into the halftime locker room up 24-0 over Grandview in its district playoff game. “We got in there and didn’t really have much to talk about. We told them, ‘It’s too hot in here. It’s too dry. Let’s get back out in our element,’” Center coach Bryan DeLong said. Indeed, DeLong’s team looked remarkably comfortable in some decidedly uncomfortable weather conditions as they steamrolled the Bulldogs 49-6 to set up a matchup with Harrisonville for the district crown next week. The most comfortable-seeming of all: junior running back Norvell Trent, who finished with 293 yards rushing on 23 carries, highlighted by three long touchdown runs of 51, 73, and 39 yards. Another 50-plus yard score by Trent was wiped out by a personal foul. “I don’t know what to say. My line was there for me. This is the best game of my career. It was great,” a breathless Trent said afterwards. What’s more remarkable is that this is Trent’s first full year playing football at any level. On a night when drizzle fell continuously from beginning to end, Center was able to control the line of scrimmage and break Grandview’s spirit early, taking advantage of repeated Bulldog miscues. After a 24-yard field goal by Donte Smith put Center up 3-0 midway through the second, Trent really got rolling. After Grandview turned it over on downs, Trent broke left on the ensuing play and sprinted 51 yards for the game’s first touchdown. It put Center up 9-0 after the point-after was blocked. On Grandview’s next possession, quarterback Reginald Collier was intercepted by Kenndle Moore. That set up what may have been Trent’s most impressive run of the night, a 73-yard scamper on 3rd-and-12. And just like that, Center found itself up 17-0. A six-yard scoring run by sophomore Rachaad White later in the second quarter gave the Yellowjackets their commanding halftime margin. Whereas Center seemed inured to the elements, Grandview never seemed to find a rhythm, even with the memories of scoring 65 points last week against Warrensburg. The Bulldogs muffed at least eight snaps in the first half and also turned the ball over three times in the game. 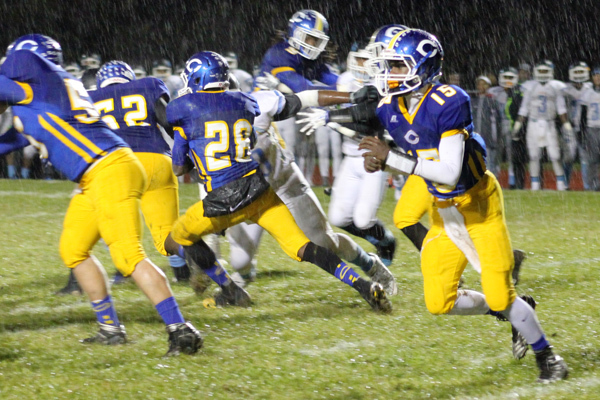 Center’s senior safety Corey Hatcher had two picks. Despite the lopsided loss, Grandview ended its season with a winning record for the first time since 2005. “We made a lot of gains this year, we developed a lot. But this is not the way we wanted to end it. This is very disappointing,” Grandview coach Jeremie Picard said. The lone bright spot in this game may have been senior running back Ja’Kori Bell, who had 17 carries for 180 yards and the Bulldogs’ only touchdown, which came early in the third quarter. “[Bell] runs hard all the time. That’s the way he is. I’m proud of him. Sticking with it, showing leadership when we’re down,” Picard said. For Center, White finished with eight carries for 88 and two rushing touchdowns. A productive night for sure, but one overshadowed by Trent’s gaudy numbers. Center, now 10-1, will face Harrisonville next week in the district final.